Our Weekly Time Cards are OEM quality approved and made with the 150Lb. Card Stock for durability and resistance to moisture. 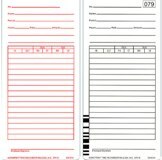 The manufacturing process employeed to produce these Time Cards includes Rotary Cutting for proper sizing and accuracy, ensuring Outstanding performance when utilized in your Weekly Time Card machine. Don't settle for an inferior Weekly Time Card...that could result in problems with your time clock equipment. Weekly time cards remain the mainstay of many companies time management systems. Our time cards are printed on manila card stock for the best visibility. Our time clock cards are OEM quality approved and made from durable and moisture-resistant 150 Lb. card stock. Rotary cutting ensures that the cards are accurate and properly cut for maximum performance in your weekly time card machine. Purchasing cheap time cards from elsewhere may cause problems with your time clock equipment. Weve assembled the list of weekly time cards below from our various manufacturers and stand behind these products. Select the time cards that match the make and model of your time clock equipment to guarantee the best results. If you cant find your weekly time cards, send us a sample and we can match it for you. Shop the selection of weekly time clock cards and enjoy free shipping on all time cards from TimeClockeShop.com today!